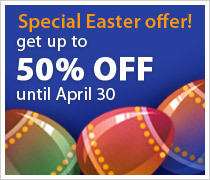 To make sure professional developers don’t waste any time hunting around for the best IDEs, JetBrains has an unbeatable offer this Easter! Also, you get 50% OFF on any edition of YouTrack — our awesome issue & bug tracker! Aww man, I just bought my copy of RubyMine 2 days ago. Anyway I can get a partial refund or perhaps a consolation prize? @Mr. Exercise: if you are an existing JetBrains customer, contact sales@jetbrains.com to negotiate a discount.